Are you unexpectedly running low on fuel in the middle of the night? Do you suddenly have to make an additional stop you weren't expecting? If you're flying through Dutchess County in upstate New York, there's a fast and easy solution! In addition to the FBOs, Sky Acres Airport has a fueling station that offers Avgas 100LL (blue) aviation fuel. The station features a FuelMaster® 24-hour self-service fueling system with a credit card kiosk that accepts Visa or MasterCard. * Our discounted cash fuel price is only available during normal business hours for the Pilot Shop. The hours are Thursday through Friday 9 a.m. to 4:30 p.m. and Saturday through Sunday 8 a.m. to 3:30 p.m. We may close due to inclement weather. Please view this document on how to use our fueling station. 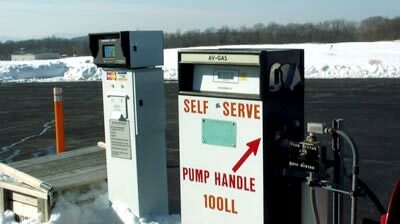 For information on how to use the SkyAcres fueling station, see the kiosk instructions. If you need assistance, you can call (845) 677-5010 and remain on the line for SkyAcres FBO. If you're researching airports near Poughkeepsie, NY or airports near Hyde Park, NY and the Hudson Valley region, Sky Acres Airport offers easy around-the-clock aircraft refueling and other services. The importance of having a fueling station open at all hours that's centrally located cannot be overstated. 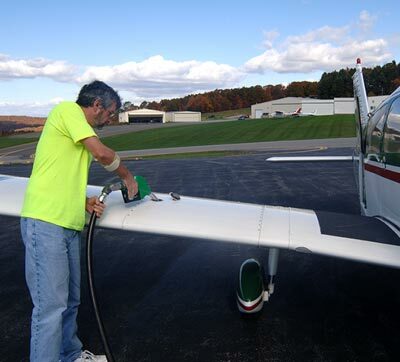 This New York airplane fueling station is a convenient stop when traveling to key nearby destinations such as New York City, the Berkshires, Hartford, Springfield, Boston and elsewhere in New England. In addition to its handy airplane fueling station, Sky Acres Airport offers other key amenities for aviators. There's a pilot shop near the pumping station that stocks oil, hydraulic fluids, lubricants, primers, polishes and other basic needs. Sky Acres Airport is the home of SkyGeek, the nation's leading aviation superstore, and the pilot shop offers in-person pickup of products ordered through the online store. Sky Acres is also home to aircraft maintenance and repair FBOs and our on-site restaurant, Tail Winds Café.